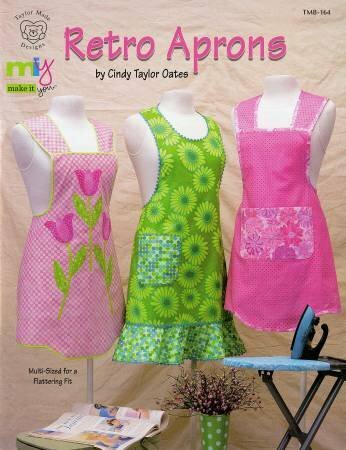 "Retro Aprons" by Cindy Taylor Oates for Taylor Made Design includes patterns and instructions for 6 different aprons. The 3 full aprons are multi-sized S - XXL and the 3 half aprons are "one size fits most". Cindy has used modern fabrics with retro shapes to showcase aprons that look fresh and colorful. But you may use "reproduction" fabrics for a more vintage look. Novelty fabrics will make great "gift" aprons. Use your imagination...embroider, embellish, and have a blast! Full-size center pull-out patterns are included in the pattern book.